Wycliffe was a keen detector of error, and he struck fearlessly against many of the abuses sanctioned by the authority of Rome. While acting as chaplain for the king, he took a bold stand against the payment of tribute claimed by the pope from the English monarch and showed that the papal assumption of authority over secular rulers was contrary to both reason and revelation. The demands of the pope had excited great indignation, and Wycliffe’s teachings exerted an influence upon the leading minds of the nation. The king and the nobles united in denying the pontiff’s claim to temporal authority and in refusing the payment of the tribute. Thus an effectual blow was struck against the papal supremacy in England. Another evil against which the Reformer waged long and resolute battle was the institution of the orders of mendicant friars. These friars swarmed in England, casting a blight upon the greatness and prosperity of the nation. Industry, education, morals, all felt the withering influence. The monk’s life of idleness and beggary was not only a heavy drain upon the resources of the people, but it brought useful labor into contempt. The youth were demoralized and corrupted. By the influence of the friars many were induced to enter a cloister and devote themselves to a monastic life, and this not only without the consent of their parents, but even without their knowledge and contrary to their commands. One of the early Fathers of the Roman Church, urging the claims of monasticism above the obligations of filial love and duty, had declared: “Though thy father should lie before thy door weeping and lamenting, and thy mother should show the body that bore thee and the breasts that nursed thee, see that thou trample them underfoot, and go onward straightway to Christ.” By this “monstrous inhumanity,” as Luther afterward styled it, “savoring more of the wolf and the tyrant than of the Christian and the man,” were the hearts of children steeled against their parents.—Barnas Sears, The Life of Luther, pages 70, 69. Thus did the papal leaders, like the Pharisees of old, make the commandment of God of none effect by their tradition. Thus homes were made desolate and parents were deprived of the society of their sons and daughters. Men of learning and piety had labored in vain to bring about a reform in these monastic orders; but Wycliffe, with clearer insight, struck at the root of the evil, declaring that the system itself was false and that it should be abolished. Discussion and inquiry were awakening. As the monks traversed the country, vending the pope’s pardons, many were led to doubt the possibility of purchasing forgiveness with money, and they questioned whether they should not seek pardon from God rather than from the pontiff of Rome. Not a few were alarmed at the rapacity of the friars, whose greed seemed never to be satisfied. “The monks and priests of Rome,” said they, “are eating us away like a cancer. God must deliver us, or the people will perish.”—D’Aubigne, b. 17, ch. 7. To cover their avarice, these begging monks claimed that they were following the Saviour’s example, declaring that Jesus and His disciples had been supported by the charities of the people. This claim resulted in injury to their cause, for it led many to the Bible to learn the truth for themselves—a result which of all others was least desired by Rome. The minds of men were directed to the Source of truth, which it was her object to conceal. In one of his tracts he said, speaking of the pope and his collectors: “They draw out of our land poor men’s livelihood, and many thousand marks, by the year, of the king’s money, for sacraments and spiritual things, that is cursed heresy of simony, and maketh all Christendom assent and maintain this heresy. And certes though our realm had a huge hill of gold, and never other man took thereof but only this proud worldly priest’s collector, by process of time this hill must be spended; for he taketh ever money out of our land, and sendeth nought again but God’s curse for his simony.” —John Lewis, History of the Life and Sufferings of J. Wiclif, page 37. Soon after his return to England, Wycliffe received from the king the appointment to the rectory of Lutterworth. This was an assurance that the monarch at least had not been displeased by his plain speaking. Wycliffe’s influence was felt in shaping the action of the court, as well as in molding the belief of the nation. The papal thunders were soon hurled against him. Three bulls were dispatched to England,—to the university, to the king, and to the prelates,—all commanding immediate and decisive measures to silence the teacher of heresy.i,ii Before the arrival of the bulls, however, the bishops, in their zeal, had summoned Wycliffe before them for trial. But two of the most powerful princes in the kingdom accompanied him to the tribunal; and the people, surrounding the building and rushing in, so intimidated the judges that the proceedings were for the time suspended, and he was allowed to go his way in peace. A little later, Edward III, whom in his old age the prelates were seeking to influence against the Reformer, died, and Wycliffe’s former protector became regent of the kingdom. But the arrival of the papal bulls laid upon all England a peremptory command for the arrest and imprisonment of the heretic. These measures pointed directly to the stake. It appeared certain that Wycliffe must soon fall a prey to the vengeance of Rome. But He who declared to one of old, “Fear not: . . . I am thy shield” (Genesis 15:1), again stretched out His hand to protect His servant. Death came, not to the Reformer, but to the pontiff who had decreed his destruction. Gregory XI died, and the ecclesiastics who had assembled for Wycliffe’s trial, dispersed. God’s providence still further overruled events to give opportunity for the growth of the Reformation. The death of Gregory was followed by the election of two rival popes. Two conflicting powers, each professedly infallible, now claimed obedience. Each called upon the faithful to assist him in making war upon the other, enforcing his demands by terrible anathemas against his adversaries, and promises of rewards in heaven to his supporters. This occurrence greatly weakened the power of the papacy. The rival factions had all they could do to attack each other, and Wycliffe for a time had rest. Anathemas and recriminations were flying from pope to pope, and torrents of blood were poured out to support their conflicting claims. Crimes and scandals flooded the church. Meanwhile the Reformer, in the quiet retirement of his parish of Lutterworth, was laboring diligently to point men from the contending popes to Jesus, the Prince of Peace. The schism, with all the strife and corruption which it caused, prepared the way for the Reformation by enabling the people to see what the papacy really was. In a tract which he published, On the Schism of the Popes, Wycliffe called upon the people to consider whether these two priests were not speaking the truth in condemning each other as the anti-christ. “God,” said he, “would no longer suffer the fiend to reign in only one such priest, but . . . made division among two, so that men, in Christ’s name, may the more easily overcome them both.”—R. Vaughan, Life and Opinions of John de Wycliffe, vol. 2, p. 6. “With whom, think you,” he finally said, “are ye contending? with an old man on the brink of the grave? No! with Truth—Truth which is stronger than you, and will overcome you.”—Wylie, b. 2, ch. 13. So saying, he withdrew from the assembly, and not one of his adversaries attempted to prevent him. Wycliffe’s work was almost done; the banner of truth which he had so long borne was soon to fall from his hand; but once more he was to bear witness for the gospel. The truth was to be proclaimed from the very stronghold of the kingdom of error. Wycliffe was summoned for trial before the papal tribunal at Rome, which had so often shed the blood of the saints. He was not blind to the danger that threatened him, yet he would have obeyed the summons had not a shock of palsy made it impossible for him to perform the journey. But though his voice was not to be heard at Rome, he could speak by letter, and this he determined to do. From his rectory the Reformer wrote to the pope a letter, which, while respectful in tone and Christian in spirit, was a keen rebuke to the pomp and pride of the papal see. “First, I suppose that the gospel of Christ is the whole body of God’s law. . . . I do give and hold the bishop of Rome, forasmuch as he is the vicar of Christ here on earth, to be most bound, of all other men, unto that law of the gospel. For the greatness among Christ’s disciples did not consist in worldly dignity or honors, but in the near and exact following of Christ in His life and manners…. Christ, for the time of His pilgrimage here, was a most poor man, abjecting and casting off all worldly rule and honor. . . .
“No faithful man ought to follow either the pope himself or any of the holy men, but in such points as he hath followed the Lord Jesus Christ; for Peter and the sons of Zebedee, by desiring worldly honor, contrary to the following of Christ’s steps, did offend, and therefore in those errors they are not to be followed. . . .
Wycliffe fully expected that his life would be the price of his fidelity. The king, the pope, and the bishops were united to accomplish his ruin, and it seemed certain that a few months at most would bring him to the stake. But his courage was unshaken. “Why do you talk of seeking the crown of martyrdom afar?” he said. “Preach the gospel of Christ to haughty prelates, and martyrdom will not fail you. What! I should live and be silent? . . . Never! Let the blow fall, I await its coming.”—D’Aubigne, b. 17, ch. 8. 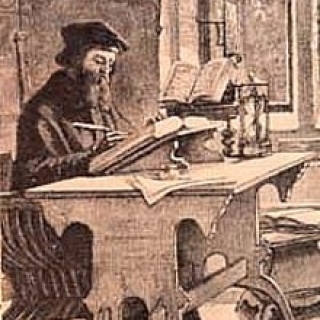 The papists had failed to work their will with Wycliffe during his life, and their hatred could not be satisfied while his body rested quietly in the grave. By the decree of the Council of Constance, more than forty years after his death his bones were exhumed and publicly burned, and the ashes were thrown into a neighboring brook. “This brook,” says an old writer, “hath conveyed his ashes into Avon, Avon into Severn, Severn into the narrow seas, they into the main ocean. And thus the ashes of Wycliffe are the emblem of his doctrine, which now is dispersed all the world over.”— T. Fuller, Church History of Britain, b. 4, sec. 2, par. 54. Little did his enemies realize the significance of their malicious act. i. Augustus Neander, General History of the Christian Religion and Church, period 6, sec. 2, pt. 1, par. 8.
ii. Wycliffe.—The historian discovers that the name of Wycliffe has many different forms of spelling. For a full discussion of these see J. Dahmus, The Prosecution of John Wyclyf (New Haven: Yale University Press, 1952), p. 7.